Pore strips you buy at the store can get really expensive! They can be as much as ten dollars for only 8 strips. That’s $1.25 per strip and to me this just wasn’t worth it anymore. After a little research I found that egg whites can do the same thing as store-bought pore strips, but for much, much cheaper. I started creating my own DIY egg white pore strips and I’ll never go back to the store bought ones! Egg whites exfoliate your skin when they are left to dry and are then pulled off. The egg white removes dead skin cells from the top layer of your skin and prevents future breakouts. This is also how the DIY egg white pore strips pull out the pesky blackheads and whiteheads from your skin. Egg whites have astringent properties that work to minimize and tighten pores. This also helps reduce the appearance of wrinkles. After you use the DIY egg white pore strips, your skin will feel tight and your pores will go into hiding. I love using these right before I go out because the affects can last up to an hour afterwards! This is why I also love using an egg white face mask! It shrinks my pores and leaves my skin glowing. 1. First you want to separate the egg whites from the yolk. You can do this by hand and let the egg white drip through your fingers into the bowl. You can also pass the yolk back and forth between two halves of the eggshell and let the egg whites drip into the bowl. Remember to discard of the yolk afterwards, we won’t be needing the yolk for this recipe. If you’re still stuck on how to remove the egg whites any of these methods will work. 3. Use both hands to dip the piece of toilet paper into the egg whites making sure to fully saturate it (see pic below) and then put it on your nose. Or you could place the toilet paper on your nose and use a kitchen brush to apply the egg whites over the toilet paper, making sure to completely saturate it. This is my favorite brush to use. 4. Make sure it is laying flat on your nose. I usually rub my fingers over it to push down all the edges that way it will pick up the most blackheads. Let the egg whites dry on the toilet paper for about 10-15 minutes or until it has hardened completely. 5. Carefully pull the DIY egg white pore strip off of your nose. Be sure to pull both sides towards the center of your nose to get better results. 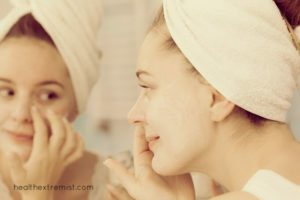 Wash your face with warm water or place a warm towel over your face for a few minutes before applying the pore strips. 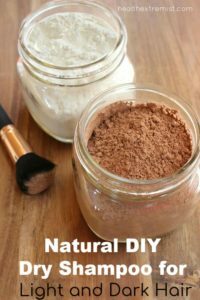 This opens your pores and gives you the best results! You can also add a few drops of lemon juice into the mixture to help the tightening of skin. If you don’t like the smell of eggs, it makes the DIY egg white pores strips smell fresh and like lemon. Always remember to try new and natural beauty products on the back of your hand first! The skin on your face is very sensitive and you want to protect it. By doing this it ensures that your skin can handle the new ingredients before you put them all over your face. If you do have any kind of reaction to the product at least it is on your hand and not all over your face. Previous Post: « How to Shave with Coconut Oil – Prevent razor burn, razor bumps and irritation! Yes, these egg white pore strips are a great natural option! It did not work for me at all. I tried to do this, but the paper completely disintegrated! Any suggestions? I would try using thicker paper. Can you use carton egg whites? It work better if you use a small strip of paper towel. Thank you for the tip! That works good too!